Don’t spend too much time building out your product without marketing it. In other words, go out there and test the market, find out if it’s worth all the time and energy. If you don’t market whatever it is you plan on building and knowing if people are willing to pay for it, you could be making a huge mistake. Leveraging online platforms is a great way to find out what people are interested in. Create online surveys, post in forums even, there are so many ways to seek out people who are more than willing to let you know if your product or service is great or needs improvement. Don’t market to everyone, not everyone is going to love your product or service. Pick your highest value audience and market to them. Follow the 80/20 rule, also known as the Pareto Principle: 80 percent of the effect comes from 20 percent of the causes. 80 percent of your effort should be spent providing value to your audience and 20 percent of your effort for promotional activity. Once you’ve established your market and are seeing your ROI go up, then you can start to expand into other markets. Don’t focus too much on branding over customer acquisition, especially at the beginning. Test your product or service and build your customer. Test online ads and other forms of content marketing, see what sticks and then keep doing more of that. Once you acquire your customers you’ll be able to build your brand over time, that’s how the process works. The best brand building is people using your product or service, them loving it, and then telling their family or friends. Amazon and Google didn’t do a bunch of TV advertising back in the day, and yet they’re multi-billion dollar companies, because everyone who was using their product or service was having an amazing time and spreading the word. Brand-oriented messages fizzle. Customer-oriented ones will help you sizzle. Show your customers the value they will get from using your product or service. People want to know how they will benefit from what you have to offer. Your customers will pay almost anything if they know it’s for something that will be of good use to them and they like it. If you can somehow benefit a person’s quality of life or enhance it, it will stimulate them to continue to use your product or service and help you build your brand for you. Communicate with your target audience. Communicating through social media or blogs is a cheap and effective way to allow your target audience to get to know what you’re about on a more personal level. People like to feel involved and like they matter, it’s the easiest way to also test out new product ideas and ads. You’d be surprised how many people like to share their own ideas with you about your product in order to help make it even better. It’s a win-win situation for everyone. Know your “Why” and share that passion with your customers or clients. Authenticity is a natural way to build trust. Sharing your passion for something will often ignite a passion in others, helping you to gain more support and momentum along the way. If people know you’re doing something for more than just the money, they’ll be more willing to come along for the ride and help you succeed. Once you’ve built up your customer base, don’t ignore your retention marketing, this should be the backbone of your marketing strategy. There are two main reasons for this, one, it’s easier to sell to someone you’ve built a relationship with. And two, it’s more profitable to sell to your existing customers. The probability of selling to an existing customer is 60 to 70 percent. The probability of selling to a new prospect is somewhere in the 5 to 20 percent range. Acquiring a new customer costs six to seven times what you’ll spend to retain an existing one. Make sure you’re documenting your content-marketing strategy before you start creating stories and other materials around your brand. It will make content creation and distribution not only easier but more effective, too. Don’t ignore new channels and platforms. Now this doesn’t mean you have to use everything out there that’s available to you. Find the channels and platforms that best suit your product or service where you’re most likely to find your target audience. The more you’re able to employ, the wider an audience you can reach. If you find that one isn’t working for you and you’ve exhausted all of its capabilities, don’t waste your time, find something else and move on. At some point that older platform may evolve to a point where it will be useful, just because it didn’t work the first time, doesn’t mean it won’t work in the future. Keep an open mind. Don’t forget about email as a promotional tool. With all the myriad of online advertising and promotional platforms, many people have forgotten just how useful email can be. Modern professionals know email marketing plays a critical role in building trust-based relationships to engage, convert and retain customers. Neglecting these responsibilities can have serious repercussions for any online business. 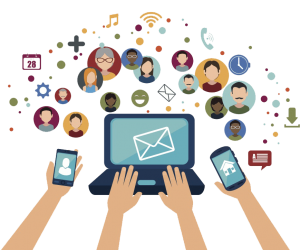 Use email as an engagement tool, don’t focus on promotions only. It’s a great way to keep your customers informed about not only your products or services, but also to share with them what your company is about, who you are and why you do what you do.